I’m only a week into this adventure, and I also have another hip to do in a few months, so it would be silly to sum things up at this point. I have much more to learn and experience, and I’ll write more as the process goes forward. That time has come. I’ve recovered from the first surgery, and on Monday of this week I had the same type of hip replacement surgery on the left side. I’ve learned and experienced a lot in the last 12 weeks, so I’m going to share some impressions now from a slightly more informed perspective. To be clear, I’m no expert on this topic. I’m just a guy who has had both hips replaced. My recovery from the first one went very well — my surgeon and physical therapist said I recovered faster than most patients, and apparently I spent more time on the details than the average patient does, but I’ll never know whether the two are related or I’m just lucky. As before, I wrote this up mostly for friends who are considering hip replacement or have a good chance of it in their future. Mine have come a little earlier than average, so I seem to know more people anticipating this procedure than people who’ve already done it. If your hips are rock-solid and you’re well under 50, this article isn’t intended for you and I certainly wouldn’t be offended if you don’t bother to read it. After a few days, the more intensive PT (physical therapy) began. It’s mostly about learning to walk without a limp, and your muscles need to get stronger to make up for various changes. You need to accomplish these goals while adhering to a set of hip restrictions such as not crossing your legs or bending more than 90 degrees at the waist for a few weeks (or longer in some cases). I should point out that there are many different ways to do a hip replacement, and I’ve had the posterior approach both times, so I’ve been working through the specific issues involved in recovering from that procedure. There is also an anterior approach where the surgeon comes in through the front of the leg, and if you’re interested in that debate you can find online many passionate opinions from orthopedic surgeons and patients regarding the differences. At the risk of generalizing about a topic I don’t fully understand, it seems that fans of the anterior approach talk about how short the recovery time is, and surgeons who prefer the posterior approach like the extra visibility they have when installing the new hip from that angle. My surgeon Dr. Bruckner only does posterior replacements, and that’s good enough for me: I chose a surgeon, not a surgery, and I’m comfortable with him making those decisions, given his track record. After three weeks, I was to the point where most of my PT time was just walking, sometimes with Nordic walking poles and sometimes without. 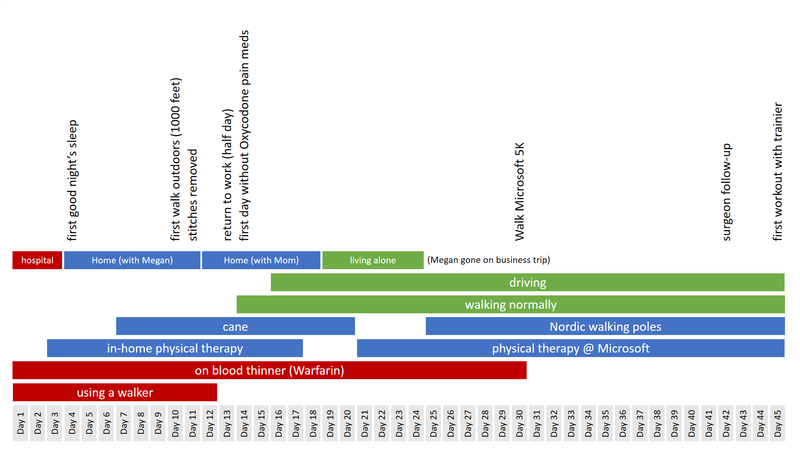 I completed the Microsoft 5K with Nordic poles on Day 30, which felt good as a milestone. For hip #2, I had the same hospital stay (two days), but I’ve already had a good night’s sleep on Day 3 instead of Day 4. It’s early, but I feel like this recovery will go faster, both because I already know the drill and also due to a couple of the changes covered below. First, a few things that didn’t change. Many details of my two hip surgeries stayed exactly the same. 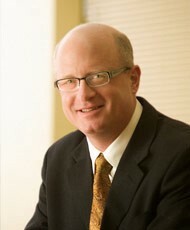 Most notably, I had same orthopedic surgeon both times, Dr. James Bruckner of Proliance. He’s so popular that you have to wait to get in to see him (I had to wait over two months for the initial consultation), but I highly recommend him. As I said after my first surgery, “I like Dr. Bruckner’s style and that of every member of his team I’ve dealt with: they’re sharp, alert, consistently positive without being pollyannish, and extremely well-organized.” It was exactly the same experience the second time. 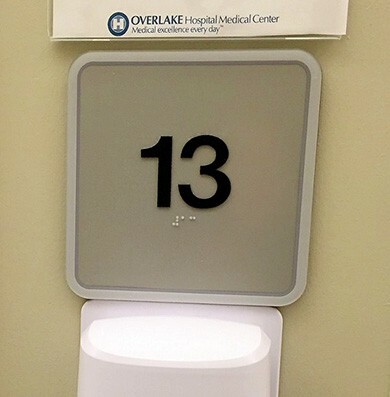 Scored lucky room #13 for pre-op, that’s when I knew everything would go smoothly. Some of the Overlake Hospital staff members I met after my first surgery were also there for my second one. For example, It was comforting to start the day with a familiar face and personality: John the pre-op RN with curly silver hair, long goatee, and a big purple-handled comb in the back pocket of his scrubs. He got me prepped, including details such as the dots on my feet where they would check my pulse after surgery and a big blanket with an attached tube gently blowing warm air on me — studies have found that you’re less likely to get an infection when you’re nice and warm. John has a quick smile and the calm, steady demeanor of a guy who’s seen it all. Once I got back to my room after the surgery, I ran into a few more familiar faces. Tom, the tall daytime RN with a Type 1 diabetes bracelet tattooed on his wrist, gently pushed me both times to take enough Oxycodone to stay ahead of the pain curve. He may have accurately surmised that I have a tendency to not take pain management seriously (pain meds are for wimps! ), and in fact on the first night of hip #2 I definitely got “behind the curve” for a while, but Tom helped me get back on track in the morning. Patrick, a tech (nurse’s assistant) who works night shift, is a model of efficiency. He has mastered the subtle art of moving quickly at all times without ever seeming brusque or impatient. 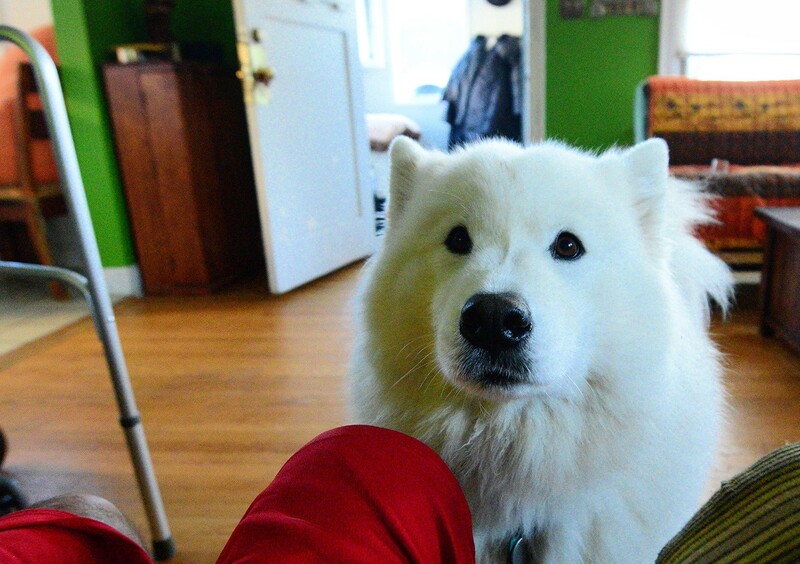 The perfect guy to show up at 2AM when you really need to pee — he’s gone before you realize you’re done. My own blood on standby in case a transfusion was needed. It was not. It was great to see these guys. They all felt like old friends after working with them for a few days less than three months ago. Many details were different this time around, and the biggest difference was the change in anesthesia protocol. For hip #1, my anesthesiologist Dr. James Larson administered a general anesthesia with a morphine-based epidural pain killer. That was the approach Bruckner’s team was recommending for hip replacements at that time. But in the weeks since then, they’ve changed their approach. For hip #2 anesthesiologist Kevin Fujinaga recommended a bupivacaine spinal instead of general anesthesia. He said they’ve found that most patients recover more quickly that way, with less nausea and other symptoms. 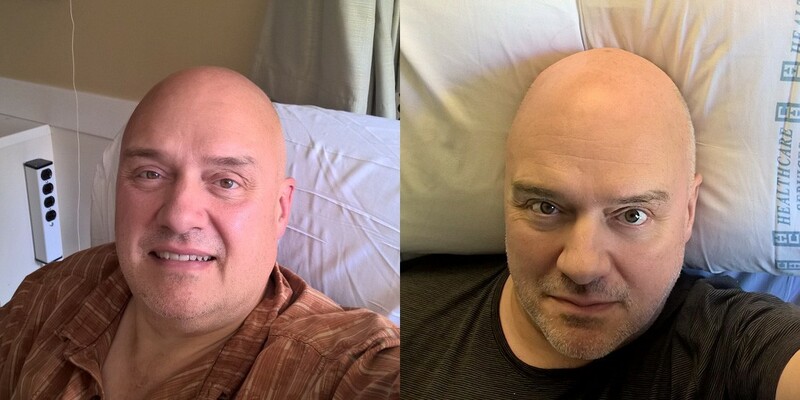 Left: 48 hours after hip replacement #1, coming out of general anesthesia and morphine. 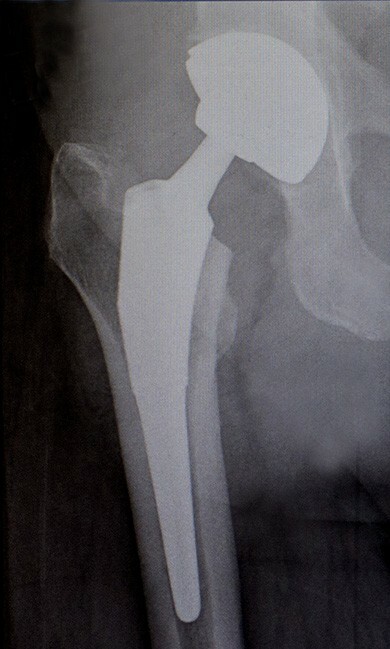 Right: 48 hours after hip replacement #2, coming out of a Bupivicaine spinal instead. The guy on the right is feeling a little more pain than the guy on the left, but he’s more clear-headed and happier overall. I hesitated at first — I’ve heard of the sawing and pounding that goes into a posterior hip replacement (hell, they start by deliberately dislocating the old hip), and I sure didn’t want to be awake for any of that! Kevin explained that I would be “deeply sedated” instead of unconscious, a distinction without a difference in most cases. I said sure, let’s go for it, and as it turned out everything was fine. The only thing I remember hearing during the surgery was a snippet of conversation about the Seahawks-49ers game the day before, and it seems likely that was in the recovery room. There are several differences between the bupivicaine experience and the general anesthesia experience, some positive and some slightly negative, but overall I much preferred this approach. If I ever need a similar surgery in the future, I’d want the bupivicaine spinal. 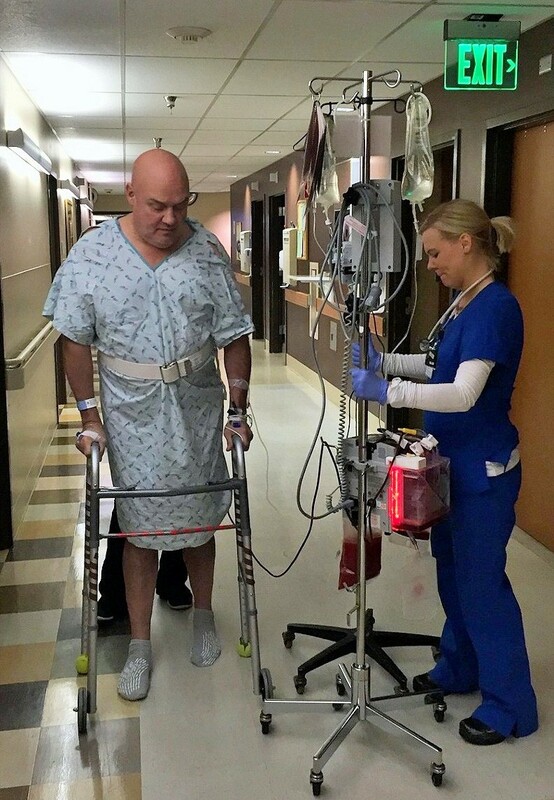 Kylie the night nurse taking me on my first walk: ~100 feet, 8 hours after surgery. Less pain relief. The morphine with the general anesthesia had stayed in my system for many hours, but I was starting to feel the pain of the incision within 4 hours this time, so I started taking Oxycodone then. 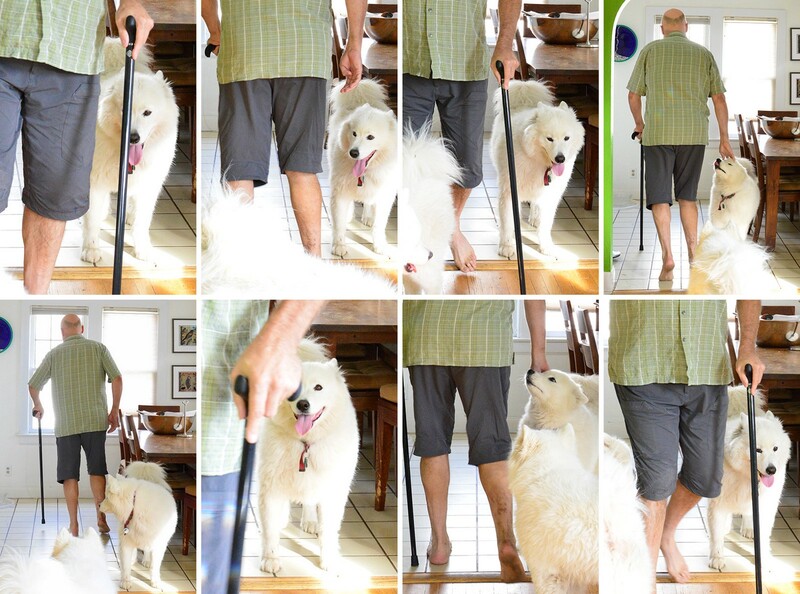 First walk sooner, but more pain. With the morphine, I was too dizzy to risk walking until a full 18 hours after surgery. With the bupivicaine, my head was clear and I took a good walk at the 8-hour mark, but even with the maximum dose of Oxycodone I felt it more than the first walk after hip #1. Appetite returned much faster. With the morphine I didn’t really eat an entire meal until two days after the surgery, and I’m not one to lose my appetite easily. With the bupivicaine, I enjoyed a bowl of chicken soup and some pasta just 6 hours after surgery, and finished it quickly because I was hungry. When I saw Kevin the day after surgery, I told him I much preferred the bupivicaine spinal, and he said “for the right person, this approach seems to work great.” The physical therapists on my floor had similar comments as well. Apparently some people prefer the morphine. But I’m glad to have a little less pain control (which can be remedied for the most part with other meds) rather than spend two days feeling stoned and groggy. I’m not on a blood thinner this time! I love this — it’s stressful to take Coumadin (warfarin) for a month. You have to be very careful with your diet, you have to go into the “anti-coagulation clinic” twice a week to get an INR test, and if you bang you head you need to call 911 right away before the swelling grows so quickly that you’ll pass out or worse. Instead, the strategy for minimizing risk of blood clots this time is to take aspirin twice a day and stay very active (which I like). I have a waterproof Aquacel dressing this time, so can take a shower any time. I just did a sponge bath when I got home last night, but it’s nice to know I don’t have to do that for two full weeks. This one’s self-inflicted, but I gave in and got a temporary handicapped parking permit this time. Last time I didn’t bother, thinking that it would be good for my recovery to walk further any time I needed to park and walk into a building, but that was when it was warm and sunny. I’m guessing there may be cold rainy days ahead when I won’t be too proud to park in a handicapped spot. 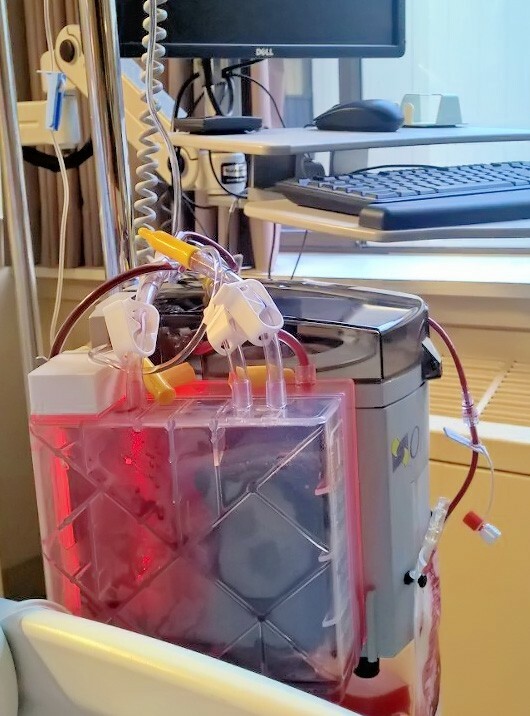 And here’s a difference I think I forgot to mention in the first draft of this post because it’s something so unpleasant that I’ve successfully repressed my memory of it the first time around: due to the lack of general anesthesia, there was no urinary catheter this time! The removal of that catheter is my most disturbing memory of the first hip replacement. Surgical procedures are evolving quickly, and I wasn’t expecting to see so much change in just 12 weeks, especially considering it was the same team at the same hospital. But it presents an opportunity to recover even faster and get even stronger, and I’m planning to take advantage of that opportunity. Let’s do it, Jamie! Back home with nurse Jamie, time to do it all one more time. UPDATE: after the final surgeon follow-up six weeks later, I wrote up a few final thoughts in Cleared For Takeoff.